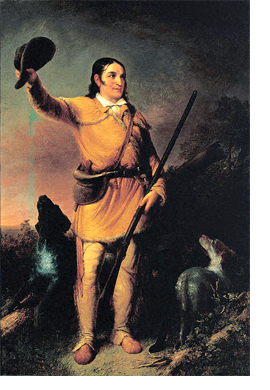 David “Davy” Crockett remains one of the best-known American folk heroes. Although commonly referred to in popular culture as “King of the Wild Frontier”, he was so much more. He served as a Congressman, representing Tennessee. He was also a key figure in the Texas Revolution, and died heroically at the Battle of the Alamo. Crockett gained his reputation as an outdoorsman and adventurer growing up in eastern Tennessee. His larger-than-life exploits were chronicled during his own lifetime and continue to this day to be celebrated in American culture. After serving as a colonel in the Tennessee militia and in a stint in the state legislature, he was elected to the U.S. Congress in 1826. During his tenure in Washington, Crockett was initiated into Freemasonry and became a Master Mason. Although initially elected to Congress as a staunch supporter of President Andrew Jackson (also a Freemason), Crockett came to oppose several of Jackson’s initiatives, which eventually caused him to lose his seat in Congress due to the popularity of the president. This, unfortunately, was never to be. Crockett arrived in Texas after a two month journey and immediately enlisted as a volunteer. Just a few short weeks later, he arrived at the Alamo in San Antonio just before the epic battle against the Mexican army of Santa Anna laid siege. Davy Crockett lost his life in that battle along with scores of other brave men – many of them Freemasons. Davy Crockett lived his life as the embodiment of the American spirit of freedom and justice. Although his life was cut tragically short, his legend shall endure forever.